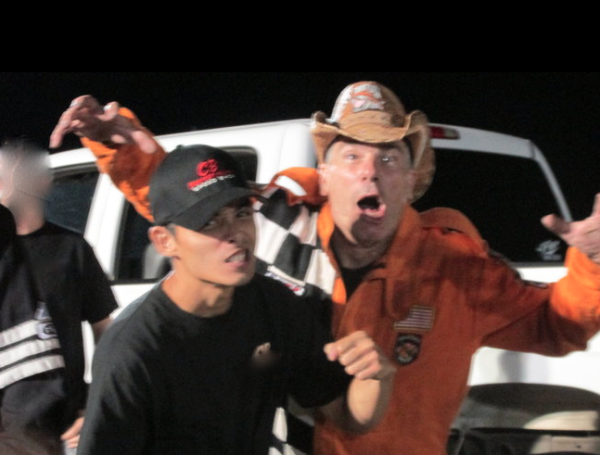 Street Outlaws star AZN, aka Jeff Bennett, has been Farmtruck’s barker for years which means he does the smack talking and Farmtruck, aka Sean Whitley, does the driving. AZN and Farmtruck met racing the streets of the 405 and as AZN says, when you meet street racing you either become enemies or fast friends. They became friends. AZN is scared of a lot of thing although street racing isn’t one of them. He is said to be loyal to the Farmtruck after he lost both of his parents. Last year, AZN bought his own sleeper, a 1966 Volkswagon bug, affectionately known as the “Dung Beetle”. While it looks like nothing more than a filthy, rusted piece of dung on wheels, under the hood it’s all about speed with a 1000 horsepower turbo-charged precision engine. The Dung Beetle gives AZN and buddy Farmtruck more opportunities to do some “fishing,” finding unsuspecting suckers to race. Their strategy is pretend to be very impressed with the mark’s car and downplay the Dung Beetle’s power. Next step is to race, win and collect some fast cash. In 2014, AZN raced a souped up riding mower in the first annual Grass Car races. He smoked the competition, literally when the motor blew up. For AZN and Farmtruck, one man’s garbage is another man’s race car. Whether it’s the old riding mower or a rickshaw from a second hand store. Louise, a 14-year-old Blue Heeler dog, is Farmtruck and AZN’s faithful mascot. Louise is loved by Farmtruck although it is mentioned that she hates AZN.